Well, everything but the warm hot cocoa was right, I stood around and shot a few more hundred frames… something I’m a bit paranoid about doing, since you never know when I might make it back, although I am already turning the pages of the calendar forward to see when my feet can land in Yosemite again. Its really that magical. Like I said, 4 frame pano, set to 5 bracketed exposures each… 20 total images. Brought into Photomatix Pro 4, cleaned it up in Photoshop and then finished it using NIK’s Silver Efex Pro. The longest part of the process is waiting for those sets of 5 to be “churned out” in the Photomatix “Matrix” (hmmm… maybe a recommendation for the next upgrade). As with some of the other shots from Yosemite, I wish the sky had a bit more “drama”.. some angry birds, errr, I mean clouds would have been nice… but, when you are here, you get what you get and don’t get upset. After all, half the fun of shooting landscapes is showing up, rolling the bones, and seeing where they land. 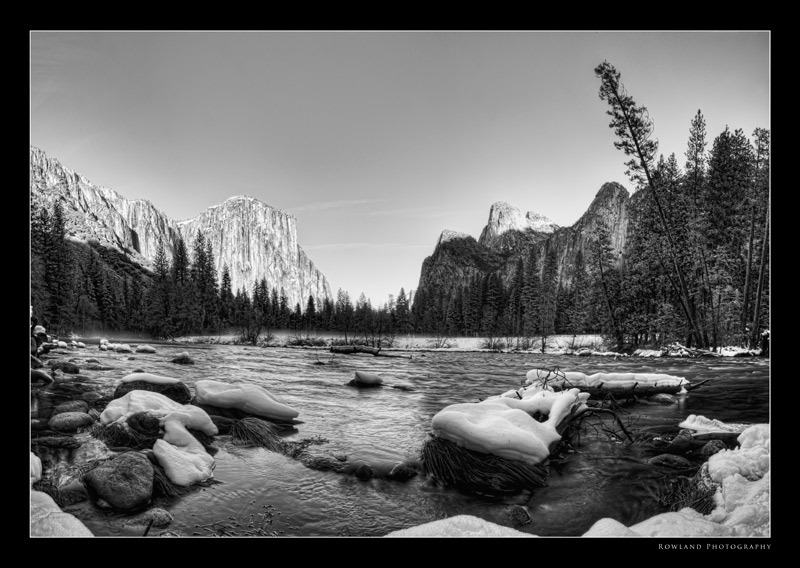 Certain images just lend themselves to a Black & White conversion. 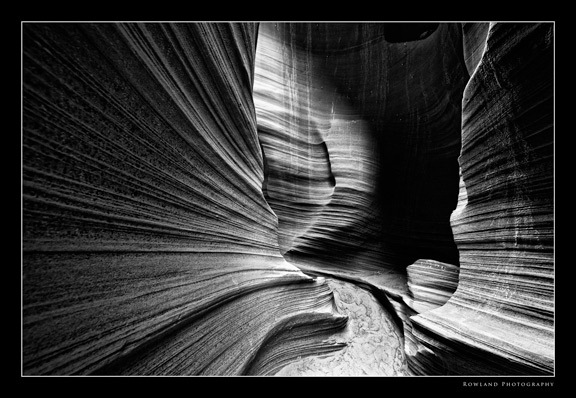 Antelope Canyon, I believe, lends itself to a monochromatic POV. While its color is unearthly, the striations along the rock, the curving walls, the texture of the rock all lend themselves to black & white. Used Silver Efex Pro. Literally 3 clicks to turn this color image into a powerful piece of art. New York City is full of buildings with incredible ceilings. Painstakingly hand tiled, the symmetry, the arches… they all add up to one incredible image. The shame is most people never stop to look up and appreciate the work above their heads. 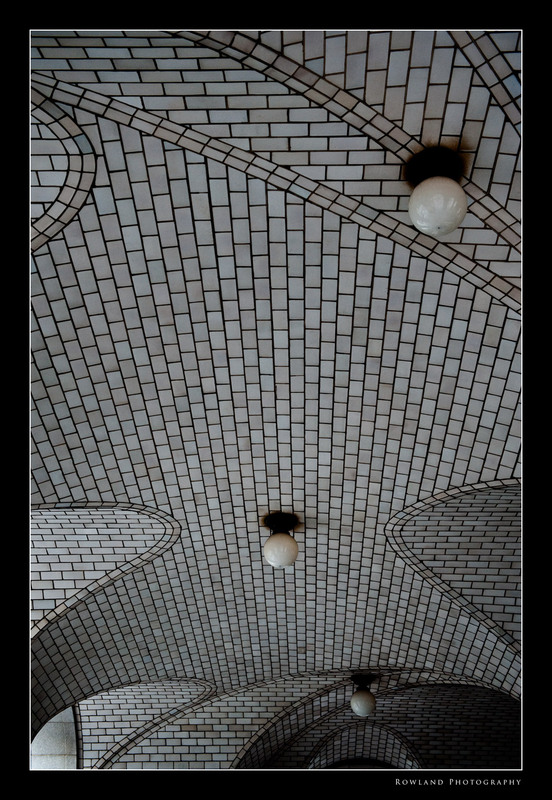 Ellis Island has a ceiling like this, so does Chamber Street Station at the foot of the Brooklyn Bridge (Manhattan side). I shot close to 100 images in a span of a few minutes, just love how it looks. For years Ive been looking for a lonely tree shot… I don’t think this one accomplishes the objective but it’s a work in progress. Would love to find a tree against the perfect sky (either silo or not) maybe a fence running through the image as well. Something that conveys that sense of broad expansive space, and yet a touch of loneliness. Maybe a big oak tree (so if anyone knows a shoot location like this, plane tickets can be readied immediately). This was shot on the POrt Royal Golf Course in Bermuda. Actually, had to edit out 2 trees to the left in digital darkroom post-processing (so powerful is the call to find that ONE TREE). Work brings me to Las Vegas this wek, posting may be a little interrupted, but hoping to grab some great images of the place (again!). Going witht he idea of HDR’ing at night- Luxor, New York, New York, etc. This is an image taken about a year ago in front of the Bellagio portico- I think it has a very 20’s feel to it when converted to Black & White. Been playing with Silver Efex Pro sparingly, but lately, been applying it to more and more images that I think would make a nice Black and White (or White & Black… take your pick) image. The one below started out in color, but was lacking some pop to really make it stand out. 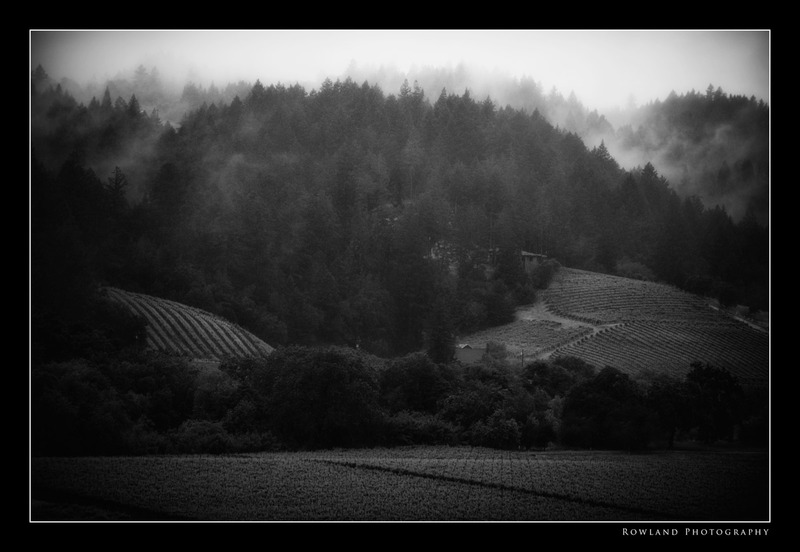 After running Silver Efex, and playing with the sliders a bit, I settled on the following… thoughts?